Remember, the best way to teach a person or animal a behavior is to use positive reinforcement. For example, Skinner used positive reinforcement to teach rats to press a lever in a Skinner box. At first, the rat might randomly hit the lever while exploring the box, and out would come a pellet of food. After eating the pellet, what do you think the hungry rat did next? It hit the lever again, and received another pellet of food. Each time the rat hit the lever, a pellet of food came out. When an organism receives a reinforcer each time it displays a behavior, it is called continuous reinforcement. This reinforcement schedule is the quickest way to teach someone a behavior, and it is especially effective in training a new behavior. Let’s look back at the dog that was learning to sit earlier in the module. Now, each time he sits, you give him a treat. Timing is important here: you will be most successful if you present the reinforcer immediately after he sits, so that he can make an association between the target behavior (sitting) and the consequence (getting a treat). Once a behavior is trained, researchers and trainers often turn to another type of reinforcement schedule—partial reinforcement. In partial reinforcement, also referred to as intermittent reinforcement, the person or animal does not get reinforced every time they perform the desired behavior. There are several different types of partial reinforcement schedules (Table 1). These schedules are described as either fixed or variable, and as either interval or ratio. Fixed refers to the number of responses between reinforcements, or the amount of time between reinforcements, which is set and unchanging. Variable refers to the number of responses or amount of time between reinforcements, which varies or changes. Interval means the schedule is based on the time between reinforcements, and ratio means the schedule is based on the number of responses between reinforcements. Now let’s combine these four terms. A fixed interval reinforcement schedule is when behavior is rewarded after a set amount of time. For example, June undergoes major surgery in a hospital. During recovery, she is expected to experience pain and will require prescription medications for pain relief. June is given an IV drip with a patient-controlled painkiller. Her doctor sets a limit: one dose per hour. June pushes a button when pain becomes difficult, and she receives a dose of medication. Since the reward (pain relief) only occurs on a fixed interval, there is no point in exhibiting the behavior when it will not be rewarded. With a variable interval reinforcement schedule, the person or animal gets the reinforcement based on varying amounts of time, which are unpredictable. Say that Manuel is the manager at a fast-food restaurant. Every once in a while someone from the quality control division comes to Manuel’s restaurant. If the restaurant is clean and the service is fast, everyone on that shift earns a $20 bonus. Manuel never knows when the quality control person will show up, so he always tries to keep the restaurant clean and ensures that his employees provide prompt and courteous service. His productivity regarding prompt service and keeping a clean restaurant are steady because he wants his crew to earn the bonus. With a fixed ratio reinforcement schedule, there are a set number of responses that must occur before the behavior is rewarded. Carla sells glasses at an eyeglass store, and she earns a commission every time she sells a pair of glasses. She always tries to sell people more pairs of glasses, including prescription sunglasses or a backup pair, so she can increase her commission. She does not care if the person really needs the prescription sunglasses, Carla just wants her bonus. The quality of what Carla sells does not matter because her commission is not based on quality; it’s only based on the number of pairs sold. This distinction in the quality of performance can help determine which reinforcement method is most appropriate for a particular situation. Fixed ratios are better suited to optimize the quantity of output, whereas a fixed interval, in which the reward is not quantity based, can lead to a higher quality of output. In a variable ratio reinforcement schedule, the number of responses needed for a reward varies. This is the most powerful partial reinforcement schedule. An example of the variable ratio reinforcement schedule is gambling. Imagine that Sarah—generally a smart, thrifty woman—visits Las Vegas for the first time. She is not a gambler, but out of curiosity she puts a quarter into the slot machine, and then another, and another. Nothing happens. Two dollars in quarters later, her curiosity is fading, and she is just about to quit. But then, the machine lights up, bells go off, and Sarah gets 50 quarters back. That’s more like it! Sarah gets back to inserting quarters with renewed interest, and a few minutes later she has used up all her gains and is $10 in the hole. Now might be a sensible time to quit. And yet, she keeps putting money into the slot machine because she never knows when the next reinforcement is coming. She keeps thinking that with the next quarter she could win $50, or $100, or even more. Because the reinforcement schedule in most types of gambling has a variable ratio schedule, people keep trying and hoping that the next time they will win big. This is one of the reasons that gambling is so addictive—and so resistant to extinction. In operant conditioning, extinction of a reinforced behavior occurs at some point after reinforcement stops, and the speed at which this happens depends on the reinforcement schedule. In a variable ratio schedule, the point of extinction comes very slowly, as described above. But in the other reinforcement schedules, extinction may come quickly. For example, if June presses the button for the pain relief medication before the allotted time her doctor has approved, no medication is administered. She is on a fixed interval reinforcement schedule (dosed hourly), so extinction occurs quickly when reinforcement doesn’t come at the expected time. Among the reinforcement schedules, variable ratio is the most productive and the most resistant to extinction. Fixed interval is the least productive and the easiest to extinguish (Figure 1). Figure 1. The four reinforcement schedules yield different response patterns. The variable ratio schedule is unpredictable and yields high and steady response rates, with little if any pause after reinforcement (e.g., gambler). A fixed ratio schedule is predictable and produces a high response rate, with a short pause after reinforcement (e.g., eyeglass saleswoman). 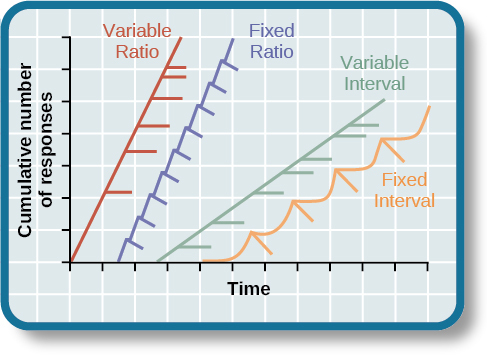 The variable interval schedule is unpredictable and produces a moderate, steady response rate (e.g., restaurant manager). The fixed interval schedule yields a scallop-shaped response pattern, reflecting a significant pause after reinforcement (e.g., surgery patient). Skinner (1953) stated, “If the gambling establishment cannot persuade a patron to turn over money with no return, it may achieve the same effect by returning part of the patron’s money on a variable-ratio schedule” (p. 397). Skinner uses gambling as an example of the power and effectiveness of conditioning behavior based on a variable ratio reinforcement schedule. In fact, Skinner was so confident in his knowledge of gambling addiction that he even claimed he could turn a pigeon into a pathological gambler (“Skinner’s Utopia,” 1971). Beyond the power of variable ratio reinforcement, gambling seems to work on the brain in the same way as some addictive drugs. The Illinois Institute for Addiction Recovery (n.d.) reports evidence suggesting that pathological gambling is an addiction similar to a chemical addiction (Figure 2). 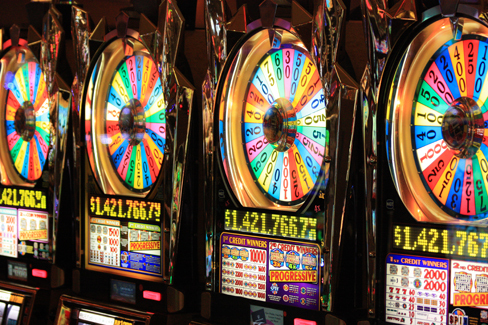 Specifically, gambling may activate the reward centers of the brain, much like cocaine does. Research has shown that some pathological gamblers have lower levels of the neurotransmitter (brain chemical) known as norepinephrine than do normal gamblers (Roy, et al., 1988). According to a study conducted by Alec Roy and colleagues, norepinephrine is secreted when a person feels stress, arousal, or thrill; pathological gamblers use gambling to increase their levels of this neurotransmitter. Another researcher, neuroscientist Hans Breiter, has done extensive research on gambling and its effects on the brain. Breiter (as cited in Franzen, 2001) reports that “Monetary reward in a gambling-like experiment produces brain activation very similar to that observed in a cocaine addict receiving an infusion of cocaine” (para. 1). Deficiencies in serotonin (another neurotransmitter) might also contribute to compulsive behavior, including a gambling addiction. It may be that pathological gamblers’ brains are different than those of other people, and perhaps this difference may somehow have led to their gambling addiction, as these studies seem to suggest. However, it is very difficult to ascertain the cause because it is impossible to conduct a true experiment (it would be unethical to try to turn randomly assigned participants into problem gamblers). Therefore, it may be that causation actually moves in the opposite direction—perhaps the act of gambling somehow changes neurotransmitter levels in some gamblers’ brains. It also is possible that some overlooked factor, or confounding variable, played a role in both the gambling addiction and the differences in brain chemistry. Review the principles and terminology connected to operant conditioning through the following PsychSim Tutorial. The tutorial is only intended for practice. Please disregard the final screen that requests you submit answers to your instructor.